The FSW has been given permission by the Council to use the old Warden’s Room in the toilet block as a visitors’ room for displays on occasions when we have events and activities in the wood. We had a lovely display of fungi and fruits photos on the occasion of our October fungi walk and we are building a little “museum” of natural items found in the wood including the skulls of badgers, foxes, deer and squirrels. Our latest addition is a display showing an owl pellet and all the bones to be found within it. In case you can’t get along to see the real thing photos of all the exhibits and their captions are displayed below. Owls usually swallow their prey whole. The food goes in to the gizzard where it is broken up and then on to the stomach where it is digested. Some parts of the prey such as bones, fur and feathers cannot be digested and these are passed back to the gizzard where they are squeezed together into a rounded lump called a pellet. The owl then coughs up (regurgitates) the pellet and drops it from its mouth. This whole process takes about 8 hours and owls usually produce 2 or 3 pellets each day. Owl pellets are interesting because they contain the bones of the prey animals. These can be identified and tell us what the bird has eaten. 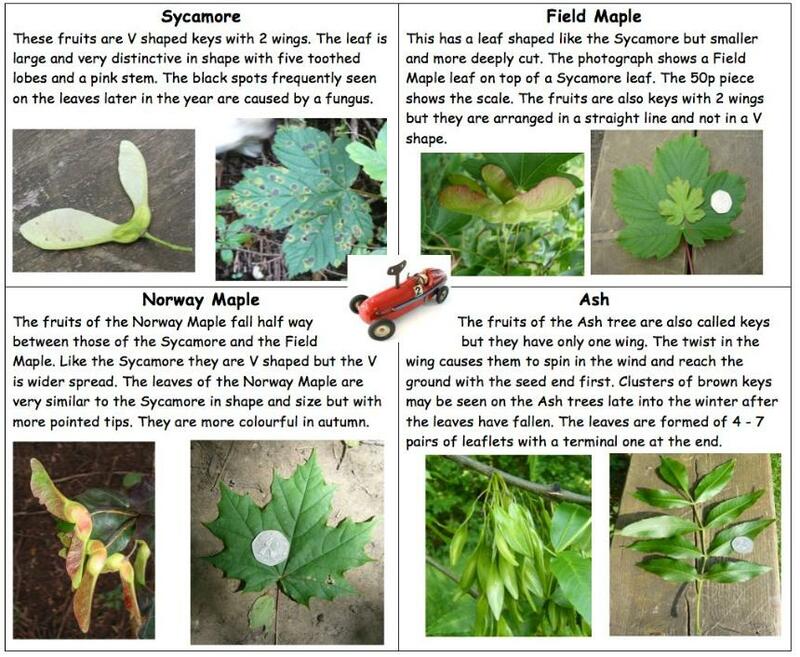 This allows us to study the food chains in any area and what small animals are living there. Most pellets can be found around the bird’s roosting place. Tawny Owls roost in Selsdon Wood and we know of one regular roost close to Linden Glade. Tawny Owl pellets have a furry surface formed from the fur and feathers of the prey. They are dark grey in colour and taper towards one end - see the one at the top left. To find out what they contain the pellets are soaked in water and then they can be broken apart (dissected). The pellet at the top right has been broken open and lots of small bones can be seen embedded in the furry mass. This exhibit shows only mammalian bones from owl pellets but owls have a wide diet taking whatever is available. Thus in some pellets there will be remains of beetles, frogs, small birds, and even grains of soil from earthworms. 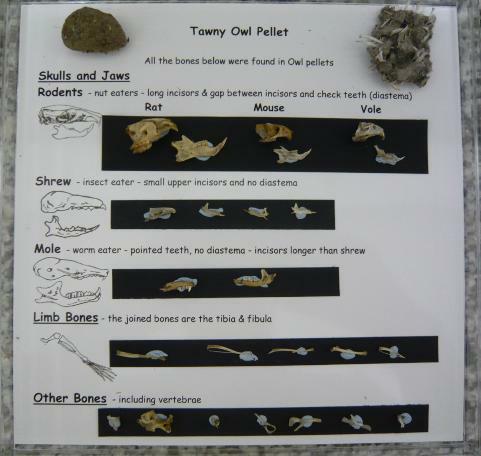 The RSPB has an excellent guide to the dissection of owl pellets at www.rspb.org.uk - just enter "owl pellets" in the search box on the home page. Galls are distorted growths on plants caused by insects. 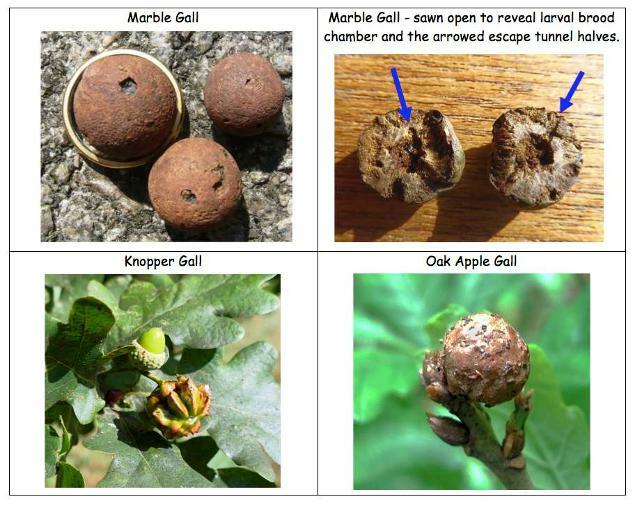 All these galls are made by wasps on Oak trees. The adult insect lays its eggs on the plant and these make the plant grow a hard or spiny lump. The insect larva grows inside the lump where it is protected. When it is fully grown the insect makes a hole and crawls out of the gall. Holes can be seen in most of the galls in the museum collection. 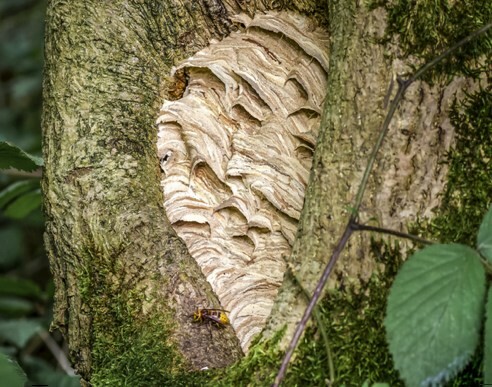 This is a section of a Hornet’s Nest that was by the side of Steven’s walk in 2014. The image below shows how it looked in the tree stump. 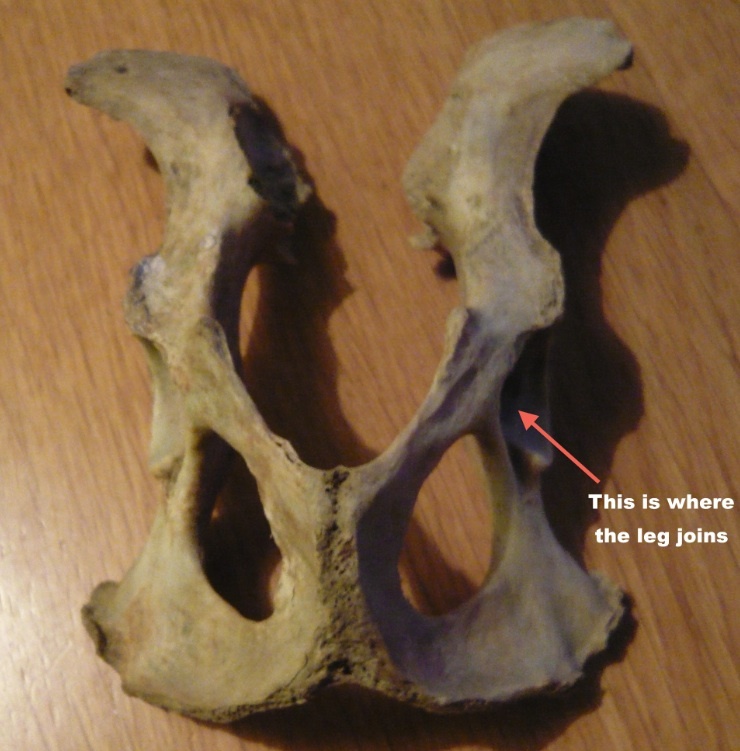 This is the pelvis (or hip bone) of a small mammal, probably a Fox or a Badger but it is difficult to tell the difference. The hind legs of the animal join into the hollows just below the large holes. Type the name of any common woodland creature into the search engine on the site to find out more about Jake's collection. 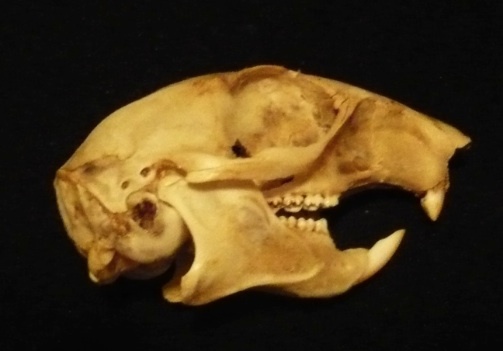 This is the skull of a young squirrel - most of them only live for one or two years. The front teeth of the squirrel (called incisors) are long and sharp for gnawing through seeds and nuts. Like the incisors of other rodents, such as rabbits and mice, these continue to grow throughout life as they are worn away with gnawing. The cheek teeth, further back behind a wide gap called the diastema, are for grinding and chewing the food. 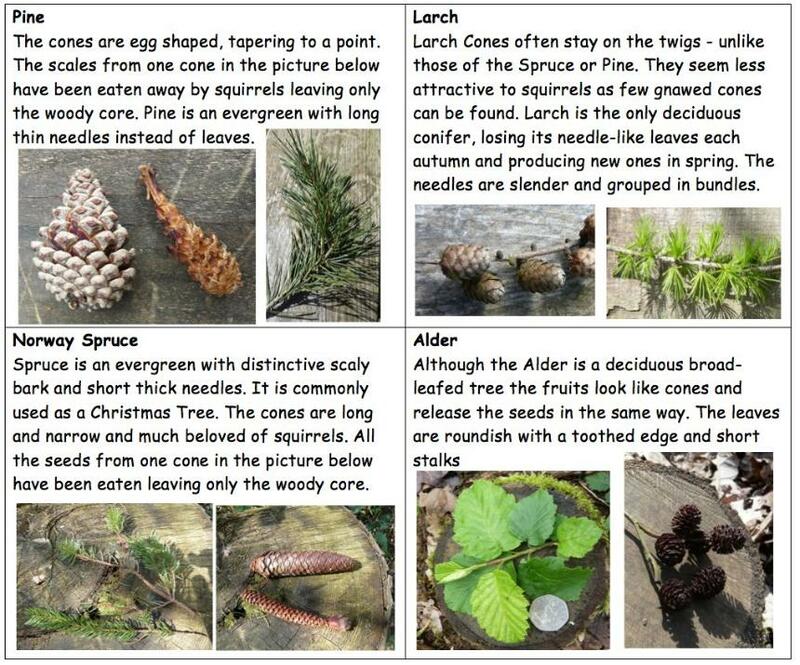 The photos show a Hazel nut and Spruce cone that have been gnawed by a squirrel. The undamaged cone shown at the top shows how much of the other has been eaten. 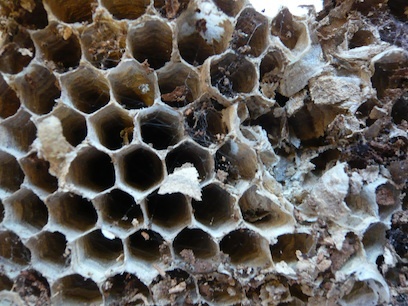 Only the woody core is left - the scales and seeds and have gone. 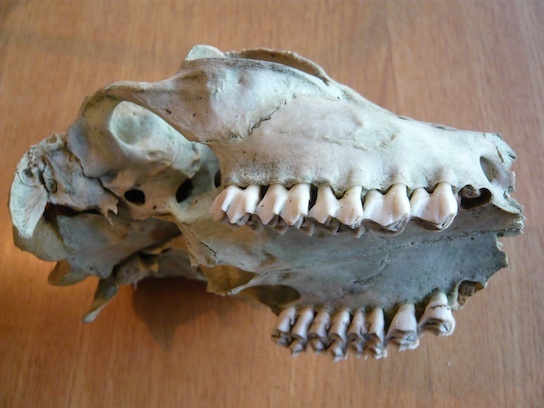 Most wild animal skulls are found without the lower jaw as this falls off when the flesh rots away. However, the Badger jaw is joined at the bone and so it often (but not always) stays attached. The Badger has the teeth of a meat-eater (carnivore) with large canine teeth for grabbing the prey and sharp edges to all the other teeth to cut up the meat. 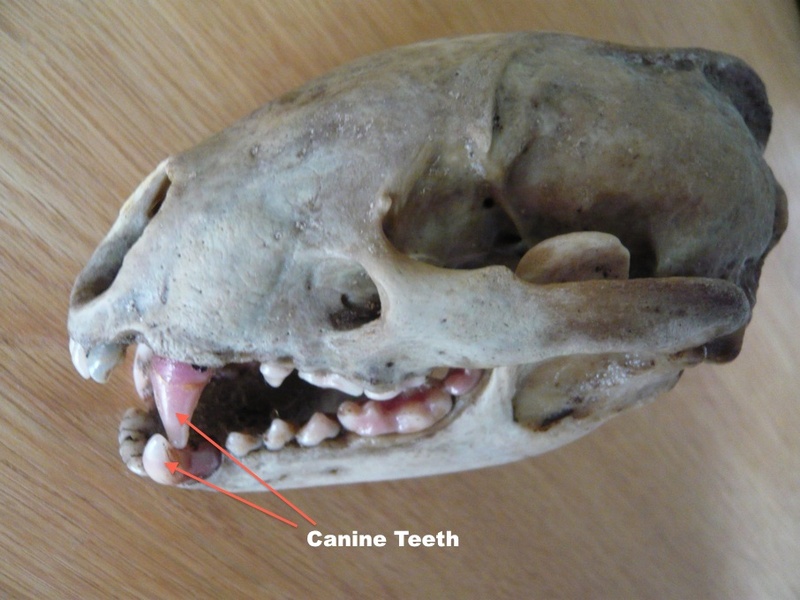 The lower canines are attached in this specimen but the upper canines are loose and may have fallen out in the box. 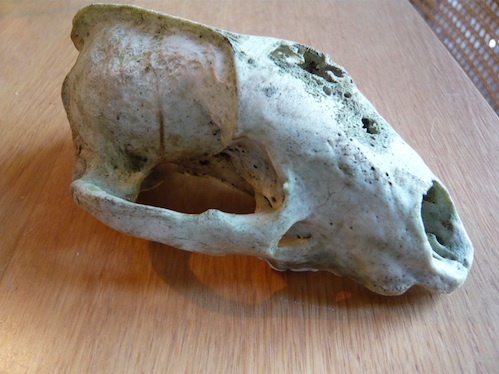 This skull was found by the badger sett in Vale Border near the Quail Gardens gate. It is probably a youngster as the teeth are still rather small and the skull isn't very large. 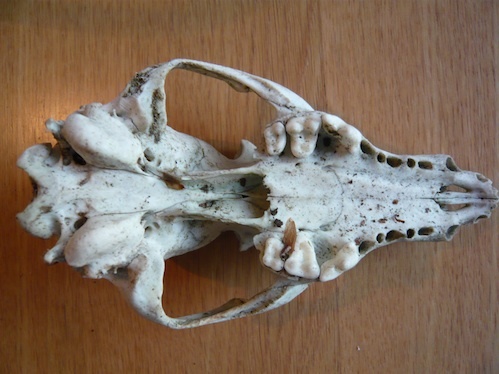 The Fox skull is more pointed than that of the Badger and there is no lower jaw on any of these specimens as it has fallen off and been lost. The canine teeth have also fallen out but you can see the large holes where they used to be. The other teeth are sharp and pointed for meat eating. 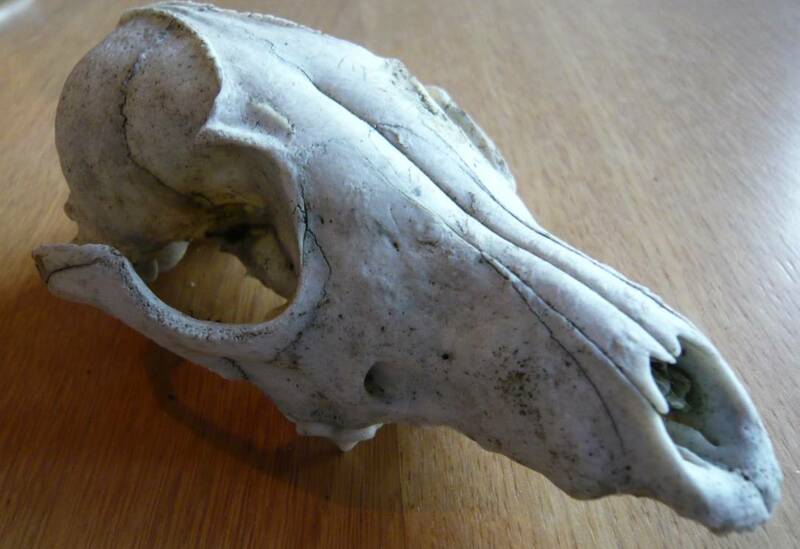 The Deer skull is larger and heavier than that of the Fox or the Badger. The end of the nose is missing from this specimen. The Deer has the teeth of a herbivore (plant eater) - there are no canine teeth and the other teeth have a flat surface for eating plants. · Which animal has similar back teeth? · Are there holes for the canine teeth? · Is the nose round or pointed? · Which skull has similar ridges on the top? 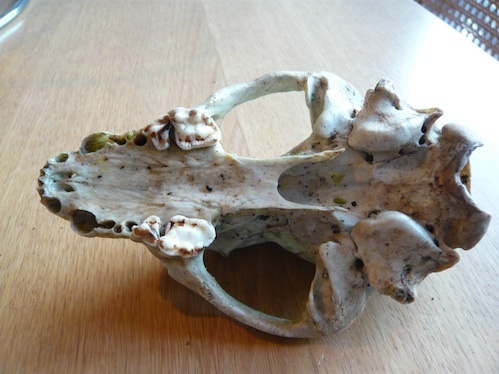 This skull was found on Hutchinson's Bank on 18/10/15. The other half of the skull with the second antler has broken away. 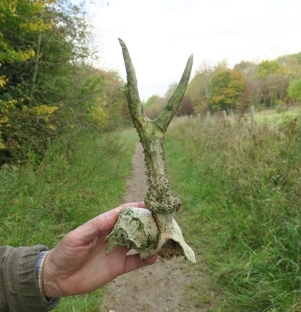 This antler is about 20cm long and looks to be from a deer in its third year - see this information from Discover Wildlife. The egg of the Wood Pigeon is pure white without any speckling. It is amongst the largest of the eggs of birds found in our wood and the shells are those most commonly found. The clean half shell with the jagged edge suggests that this egg has hatched rather than broken or been eaten. The baby bird has a sharp lump on the end of its beak (called an egg-tooth), which it uses to break a small hole in the shell. It then pushes from the inside and the egg breaks in a jagged crack around the middle like this one and the one shown on the left. If an egg just fell from the nest the shell would be broken into smaller fragments and if a Crow or similar bird ate it there would be a hole like the one shown on the right where the predator had pecked through and remnants of dried egg inside. Illustrations show the fruits on the trees - the museum has actual specimens. This guide is not comprehensive - it shows just 4 examples of each type of fruit. These fruits are dispersed by wind. They are called keys because they look like an old fashioned key on a wind-up toy. Which of the keys do you think looks most like the one in the toy? All keys are green at first and turn brown in autumn. The keys fly in the wind and carry the seeds far from the parent plant. Throw one in the air to see what happens. These fruits are dispersed by animals. Nuts are edible seeds and may grow in spiny cases that protect them until they are fully ripe. They are collected by animals such as squirrels, which carry them around the wood. 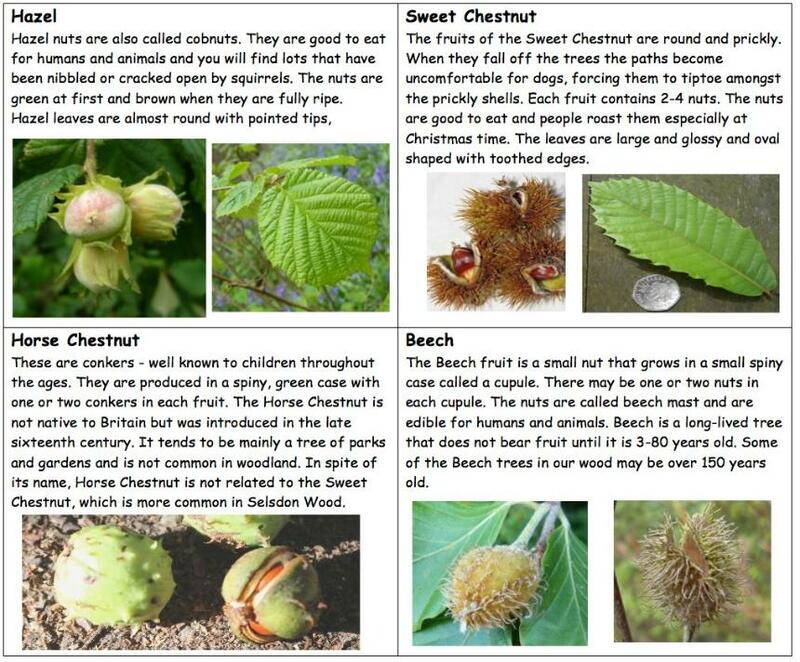 Some of these nuts are good for humans to eat but Horse Chestnuts are poisonous to humans and horses but deer and sheep eat them safely. In cones the seeds grow between the scales but these cones are old and all the seeds have gone. The scales open out in dry weather and close up again when it is wet. Squirrels eat the seeds and sometimes the scales. They carry the cones away from the parent tree and any seeds they drop can grow into new trees. The outer part of the fruit is soft and juicy but the seeds inside are hard to digest. Birds and Mammals eat the fruit and the seeds pass through their guts and are deposited in their droppings far away from the parent plant. 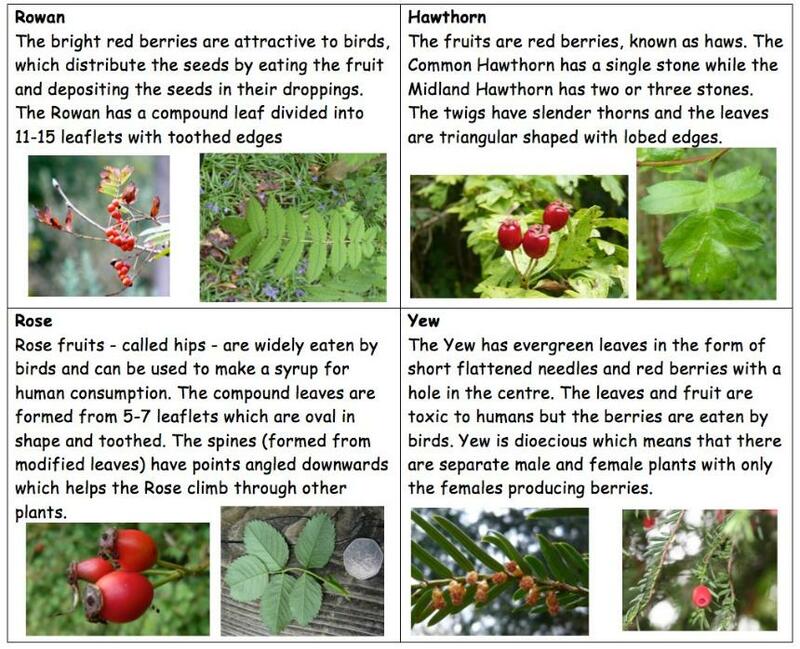 Some of these (such as Yew) are very poisonous to humans as the poison is in the seed but not in the soft fruit around it. We chew the fruit and break up the seeds but birds cannot chew and the seed just passes through their gut without breaking to release the poison. There are two kinds of Oak in Selsdon Wood - English Oak and Turkey Oak. Both have acorns but Turkey Oak acorns have hairy cups. Both kinds are shown in this museum collection. 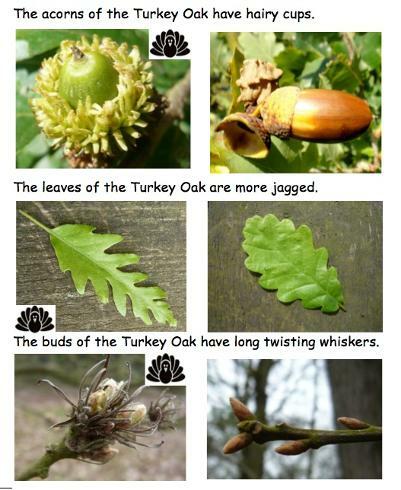 This and other differences between English and Turkey Oaks are shown in the illustration on the right.